A delicious wedding. A sour and supernatural curse. Will this baker's next bite be her last? With her wedding to Hank fast approaching, Imogen Banks has come a long way from the magical contest that brought her to Bijou Mer. But when conspirators seek to sabotage the witch's big day, she fears her latest recipe for happiness will end in disaster. And after the prince falls horribly ill, Imogen and her friends must solve one more dark mystery before her love and kingdom perish. To ask other readers questions about Bat Wings, Rings & Apron Strings, please sign up. Erin Johnson is my heroine these days... Ten (10 books) of semi-substantial page content in less than 2 years... all are great, tie together well, and make me yearn for the next release. 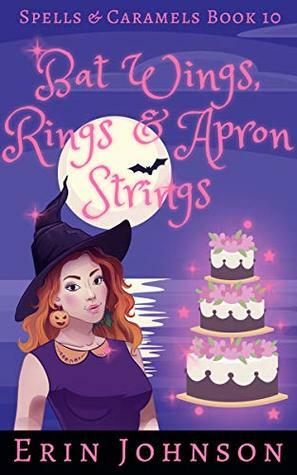 But now I suffer... because with this 10th one in the Spells & Caramels Cozy Witch Mystery series, we have the final one: Bat Wings, Rings & Apron Strings. Is it okay to cry over the end of a book even though I know the author and she's already gearing up for another series? If you're new to the series, h Erin Johnson is my heroine these days... Ten (10 books) of semi-substantial page content in less than 2 years... all are great, tie together well, and make me yearn for the next release. But now I suffer... because with this 10th one in the Spells & Caramels Cozy Witch Mystery series, we have the final one: Bat Wings, Rings & Apron Strings. Is it okay to cry over the end of a book even though I know the author and she's already gearing up for another series? If you're new to the series, here's the brief scoop: Imogen is human and doesn't know she's a witch. She has an odd baking incident and sets a building on fire, then finds herself magically transported somewhere near France. She learns the truth about her heritage, meets and falls in love with royalty, fights monsters, meets her real family, and solves crimes in the world of witchery! In this final book, Imogen is finally about to marry her beloved, but disaster strikes. Half the book involves her wedding preparations, the other half is figuring out who poisoned someone she's close to. No spoilers here! In the end, of course, she saves the day, but the path to it is quite treacherous. I loved getting to revisit characters we missed from earlier books, as Imogen goes to each of them for help. The wedding is such a fun scene, and the ending is touching. A great book, As were the last 9 in the series. I have immensely enjoyed this series, Erin Johnson is a wonderfully imaginative and talented writer . In this series she created a fabulous, original, funny and magical world that the reader was sucked into. I am sad that this series has come to an end and will miss visiting the wonderful characters she created. I am really looking forward to her next series. I voluntarily read and reviewed and advanced copy of this book. All thoughts and opinions a A great book, As were the last 9 in the series. I was given an advanced reader's copy in exchange for an honest review. This was a sweet end to a very sweet series. The very definition of cozy. A definite 4.5* for me! Kudos to this author for a terrific conclusion to the series - very well-written, all the characters and previous adventures made an appearance alongside the new adventures relating to the wedding of Imogen and Hank. I found this entire series to be imaginative and creative with a great cast of characters that I will miss - especially Iggy the flame whose snark was hilarious and added just the right touch to the storyline. I previously thought this would be a good series A definite 4.5* for me! Kudos to this author for a terrific conclusion to the series - very well-written, all the characters and previous adventures made an appearance alongside the new adventures relating to the wedding of Imogen and Hank. I found this entire series to be imaginative and creative with a great cast of characters that I will miss - especially Iggy the flame whose snark was hilarious and added just the right touch to the storyline. I previously thought this would be a good series for a younger audience as well as those just young-at-heart, but in this last book there were a few sexual innuendos (that I personally found hilarious) which took it out of the PG range. Well done to the very end - an excellent series! So glad I found this fun series! A special Wedding is about to happen for our favorite characters, when the groom is found in a death like trance on the floor! A cute just be found before he really dies. All the friends search through the kingdom's for answers. HEA for Imogen and Prince Hank with a Royal Wedding in this finale of the series following a group of friends through various mis-adventures in this 10 book series. Of course, nothing ever goes smoothly with Imogen but it always works out in the end. I recommend reading the series in order. They make great, lighthearted, fun read. I voluntarily reviewed an Advance Reader Copy from the Author. This does not affect my opinion of the book or the content of my review. The epic finale to an excellent series. Bat Wings, Rings, and Apron Strings by Erin Johnson is the tenth and final book in this fantastic series with our favorite sleuth, Imogen Banks. Well, unless Ms. Johnson figures out another mystery for her to solve. This book has a bunch of twists and turns in it, and I loved every minute of reading. Like all I voluntarily reviewed an Advance Reader Copy from the Author. This does not affect my opinion of the book or the content of my review. The epic finale to an excellent series. Like all the other Imogen books it is written in the first-person with our sleuth being the narrator. Just like the other books in the series, this one, I am most glad is written in the first person so that we can see how she is taking the news and how she is trying to overcome it on her wedding day. Iggy is probably my second favorite character of the series. He is so funny and so full of life for being a little flame. His loyalty to Imogen is shown much more in this story, and I’m glad for it. The human pop culture references are still hilarious just like in the first one. I especially liked the Jurassic Park one. Imogen being able to stop trying to solve everything on her own and trusted her friends, who are helping her, is a big thing that I like to see. Especially after she hasn’t done well accepting help in the past, it means that a lot that she is doing that now. Horace shows a lot of improvement in here along with Hank as well. These two are fantastic characters. I loved that Horace was flattened by a little blonde lady. I don’t want the series to end, but I do realize that sometimes an author needs to move on as well. However, I became friends with these characters, and I will miss them. Although, I plan to revisit them in the Audible books with Ms. Johnson's sister reading them. I can't wait to hear her voice for Iggy. Bat Wings, Rings, and Apron Strings by Erin Johnson was a great book to end the series and to start the next chapter in all of our favorite character’s lives. It ended on a high note and a way for Ms. Johnson to come back to it if she wants to. I am giving it a five-star rating and recommending it to anyone that likes cozy mysteries and baked goods too. Imogen and Hank finally get their HEA in this last installment of of the Spells & Caramels series. Bat Wings, Rings & Apron Strings starts off with Imogen, Hank, and the whole gang back in Bijou Mer preparing for Imogen's and Hank's wedding. Everyone is excited for the wedding, but is missing the slow pace of Kusuri, especially Hank and Imogen; the happy couple is not so happy with all the press, meetings, glad handing, and responsibility that comes with being back. As Amelia said in the Imogen and Hank finally get their HEA in this last installment of of the Spells & Caramels series. Bat Wings, Rings & Apron Strings starts off with Imogen, Hank, and the whole gang back in Bijou Mer preparing for Imogen's and Hank's wedding. Everyone is excited for the wedding, but is missing the slow pace of Kusuri, especially Hank and Imogen; the happy couple is not so happy with all the press, meetings, glad handing, and responsibility that comes with being back. As Amelia said in the last book, the wedding will help unite the kingdoms, but it is a lot of pressure on the frustrated couple. The Royal Bakers, have been replaced, so they are frustrated they cant help make the cake for their friends wedding, and have nothing to do; everyone is feeling the stress of being home. Amelia turned out to be one of my least favorite characters. I understand that she convinced Hank and Imogen to have the wedding back home for good reason, but the way she goes about the planning just sort of overrides what the couple wants, and she is just flat out pushy with no consideration. It's silly that I get myself so worked up over characters in a book, but this series and it's characters really does pull you into this wonderful magical world. It’s simply delightful when an author can reward series followers by providing, quite simply, the most wonderfully fitting finale. Thank you Erin! Move over damsel in distress, it’s the princess-to-be who has to rescue the handsome prince and what an adventure she has in the process. All our favourite characters from across the series are united in their efforts to save Prince Harry (Hank). As Imogen and her best friends race across the kingdoms to find the cure for Hank’s illness, we revisit som It’s simply delightful when an author can reward series followers by providing, quite simply, the most wonderfully fitting finale. Thank you Erin! Move over damsel in distress, it’s the princess-to-be who has to rescue the handsome prince and what an adventure she has in the process. All our favourite characters from across the series are united in their efforts to save Prince Harry (Hank). As Imogen and her best friends race across the kingdoms to find the cure for Hank’s illness, we revisit some past settings and catch up with old friends. The mystery itself is to solve who poisoned Hank and how. The ‘who’ was explained pretty quickly and the ‘why’ along with that. But the journey to find the ‘how’ and the cure is what really takes up the bulk of the action. The pacing of that is very good with each chapter taking us to a new suspect or location in the hunt. I quite enjoyed the interesting characters introduced along the way. One of my favourite scenes is where Imogen confronts a jealous female family friend who believes she should have been Hank’s bride. Our heroine was always feisty, but she shows that nothing is going to stand in between her and the man she loves- not even sub-par magic tricks played out by some floozy! The evolution of Imogen’s character and several of her friends, and even members of Hank’s family, was on-going throughout the series but really comes full-circle in this last book. Beautiful storylines and fanciful tales... an absolutely wonderful series and finale. I voluntarily read and reviewed and ARC of this book. Imogen, Hank, and friends are back in the Water Kingdom gearing up for the upcoming wedding that is finally on the horizon. We are down to the final handful of days with the stress mounting as the big day gets closer. The big day arrives only to have Imogen find hank cursed causing a very large scramble as the try to figure out what happened in time while also keep it a massive secret from pretty much ev *I received a free copy of this book which I voluntarily chose to write an honest review for. A fairy tale wedding or a curse to end it all? This is the final book in the Spells & Caramels series and what a finale it is! Imogen and all her friends (Iggy is still my favorite!) are back for the royal wedding of the century. But will it ever happen? Will Hank make it to the wedding on time? This was so fast paced I just didn't want to put it down! I read and thoroughly enjoyed the entire series and this is a fitting end. I will miss all my friends but look forward to what ever series Ms A fairy tale wedding or a curse to end it all? This is the final book in the Spells & Caramels series and what a finale it is! Imogen and all her friends (Iggy is still my favorite!) are back for the royal wedding of the century. But will it ever happen? Will Hank make it to the wedding on time? This was so fast paced I just didn't want to put it down! I read and thoroughly enjoyed the entire series and this is a fitting end. I will miss all my friends but look forward to what ever series Ms Johnson comes up with next. This installment is packed with hilarious situations and nail biting suspense. We can see most of the characters come together to help their friends. Sad to realize that this is the final book, but excited to expect new material from this author. The Spells & Caramels series is FIVE STARS! Everyone desires happy endings, but some take a lot more effort. Join Imogene, Hank, and their friends as they become almost slaves to all the “must attend” minutiae and events involved in a Royal Wedding, and the attempts to keep it from occurring. There are lots of twists, humor, and quirky characters. These books have kept me entertained throughout. I've read each of them and while they could be read as stand alone books, it was fun to read the series in order. The light hearted antics with a little touch of mystery made them very enjoyable. Can Imogen with her friends’s help solve the mystery of Hank’s death trance in time to marry her soulmate? A sweet and funny last book of this wonderful series. I love Imogen and all her friends. It was sad knowing this was the last in the series, but I hope her new series has some of the characters from this series in it. Either way I know I will enjoy it. This was a fun popcorn book. . One is not enough. Hope you are not done with Hank Imogene and crew. Fell in love with this series. I'm sad it has come to an end. Will miss the whole gangs adventures together.